I loved putting this layout together for the Weekly Challenge at Mouse Scrappers. It is one of my favorite memories ... from our trip to Disney World in 1995. Just love those precious memories of time together with family. 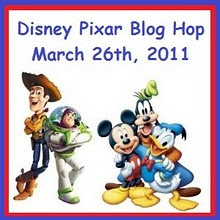 You know if it involves Disney then I'm right there ... How can you resist a blog hop with Disney & Pixar???? You can get started here. I know you will enjoy this ... so have fun!! The big announcement at Mouse Scrappers is a collab kit with several incredibly talented designers. 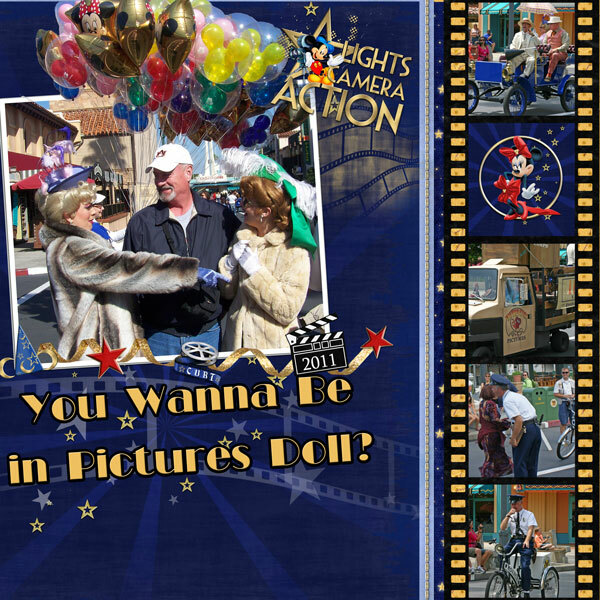 I love this kit cause we ALWAYS go through the Imagination ride at Disney World to see Figment. 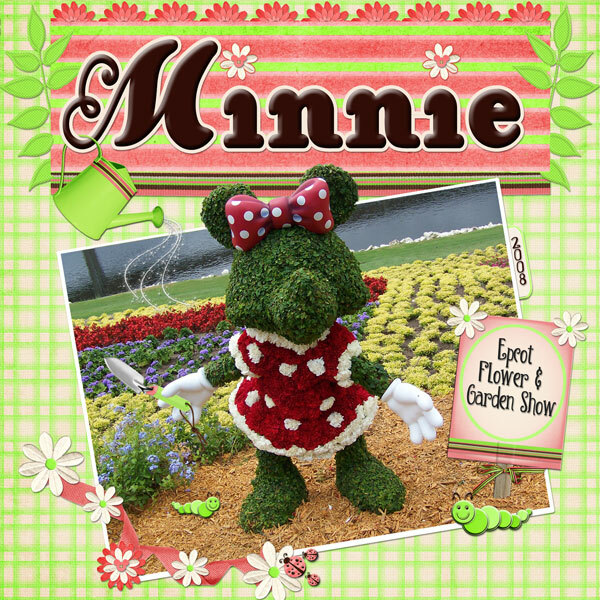 Click here to check out the new Mouse Scrapper's store and pick up this super cute kit! 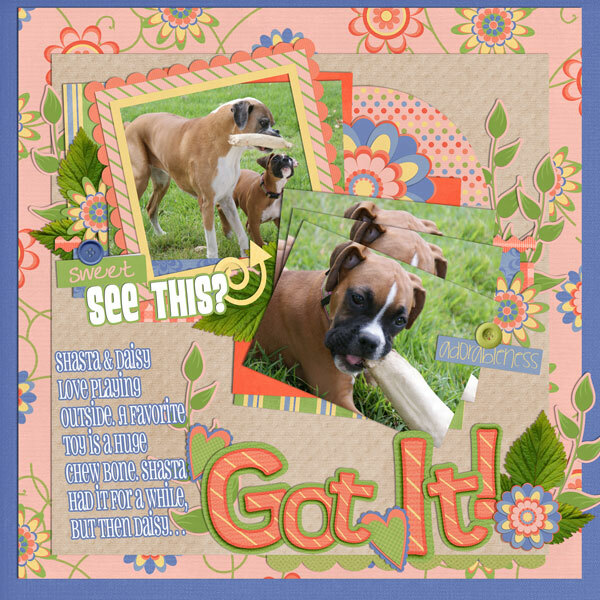 You can click here to see some of the layouts made with this kit and join a Blog Hop to get some freebies! Just scroll down a bit to the first post ... and let your imagination soar! I just finished a Speed Scrap over at Scrap Matters and used a cute new kit by Tanya at Crossbone Cuts. The name of the kit is "You're a Peach". I just love the colors and elements in her kit. If you are interested in this kit you can go here to read about it and get instructions to download free. 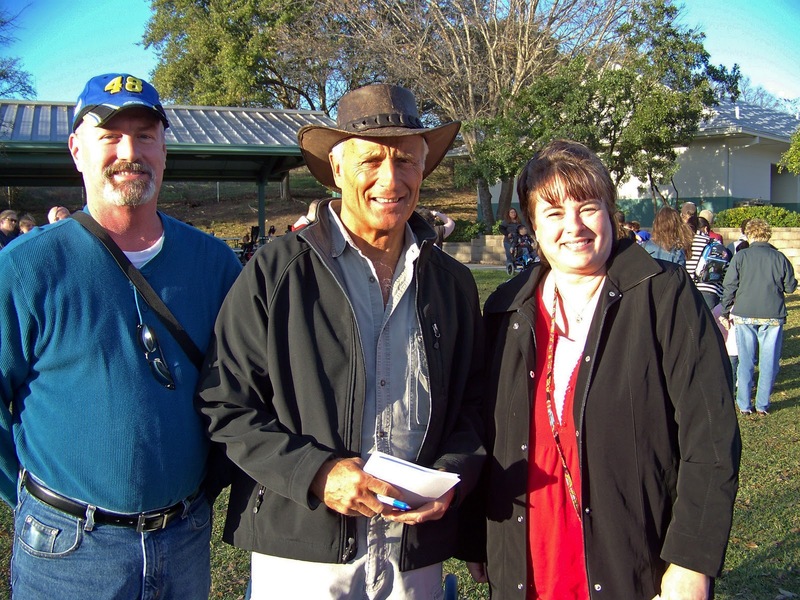 Tanya is in the fourth round of Design Star sponsored by Scrap Matters. She is such a talented designer and I wish her the best.Check out her blog and see her precious doggies! My sister-in-law had asked me about a month ago if I watched the tv show Hot in Cleveland. I told her that I had heard of it, but no I hadn't seen it. Well, there was a marathon on TVLand on Sunday so I taped a bunch of them and laughed soooo hard. While all the ladies are hilarious on the show, I just love Betty White and Valarie Bartinelli. I still chuckle about some of the episodes now ... love starting Mondays with laughter. 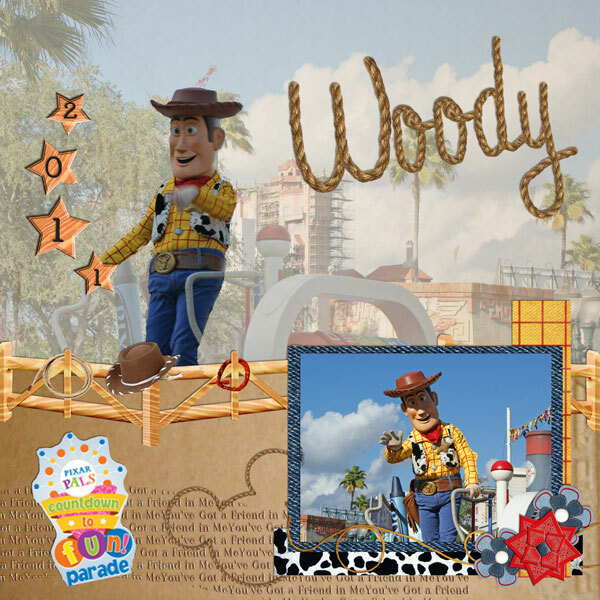 I completed a Scraplift Challenge at MouseScrappers today. The kit I used for this layout is "If You Give a Girl a Castle" kit by Erica Zane. If you ever get the opportunity to go see the Flower and Garden Show at Walt Disney World you will be amazed at the topiaries at Epcot. I missed it this year, but will certainly try to see it next year. 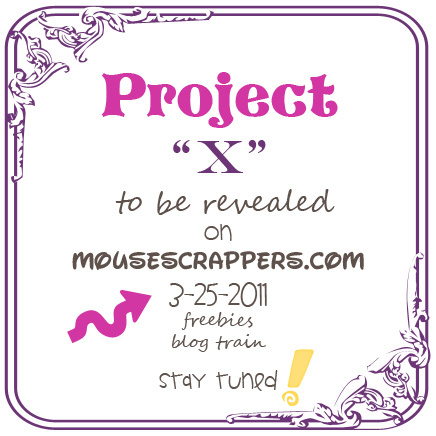 Keep your eye on MouseScrappers for something new and exciting. Help spread the word and earn points to win some exciting goodies. Just click here to read about it!! I'm going to try and finish some of the Template, Kit and Weekly Challenges over at Mouse Scrappers today. I'll just keep posting them as I finish. I actually finished this Template Challenge last night. 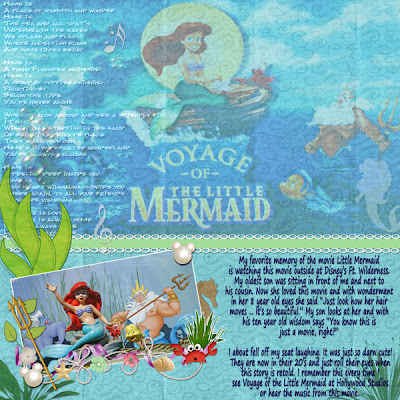 I used "Acorn Club Kit" by Natalie's Place Designs and the template is by Denise (agrievingmommy) who is hosting this challenge. 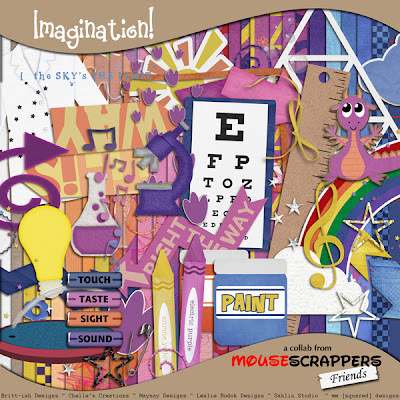 The layout below is for the Kit Challenge at Mouse Scrappers. This is the first time I have done this challenge and what fun it was. The kit is Spring Fling by Natalie's Place Designs. I just finished a Weekly Challenge at Mouse Scrappers by Denise (agrievingmommy). In this challenge you were to use at least four different designers/kits. 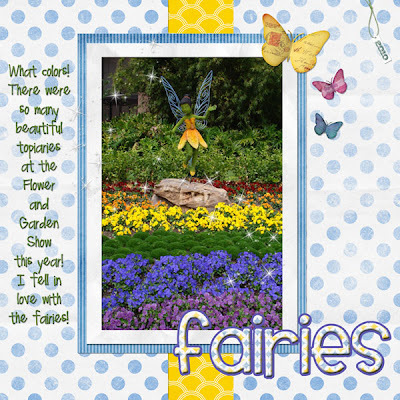 I used Mouse House by Dreamsfulfilled, I Love That Mouse and Modern Magic by Kellybell Designs, Happy by Chelle's Creation, Defining Me by Trixie Scraps, Just Plain Fun by Britt-ish Designs, and Belshaw, Arnprior & Disney Park fonts. I'll be back with more pages and actually did start on my Tim Holtz configuration box project ... 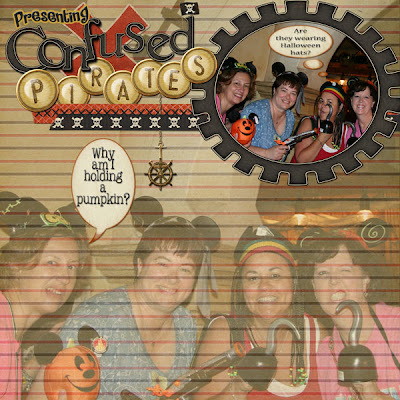 I'm combining two of my favorite things ... Tim Holtz and Disney! I know, what a surprise ... ha! I appreciate y'all dropping by! 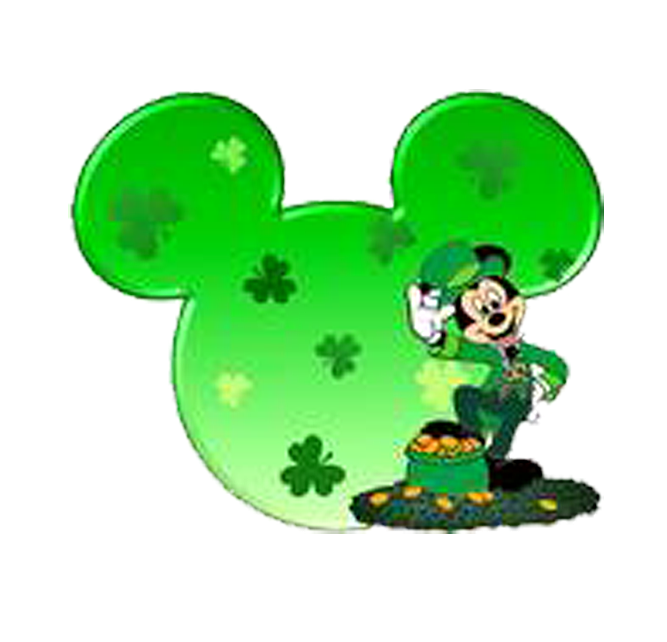 As I'm sure you know, if you have read my blog, I absolutely love Disney. So when I was deciding what color to paint my scrap room it really was simple ... yellow, red & black. The main change through the years has been the addition of MORE STUFF! So here is my room now. 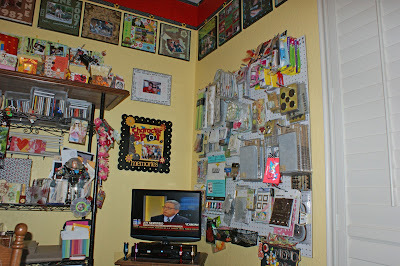 A big change for me was removing the paper tray stacks from along the wall and putting them in my closet. I had Curt remove the closet doors and I put the trays in there. I then put a shelf on top of it to make my die cut area. The other big change was adding a metal rack, my TV, and the newest addition ... my extra pegboard! The other important part of my scrap room is my computer and Cricut area. On top of my memory board I have a Mickey and Minnie placemat and on the bottom I have the cutest Halloween Mickey placemat. They are fantastic for decorating. I also have several Disney key chains hanging all over the board. On the back of my door I have a hanging shoe organizer that I put most of my punches in. My other new addition ... and my most recent exciting one is my VAGABOND! I am loving this! I have looked at a lot of scrap rooms and have used some of the ideas I saw there. The best was the use of pegboard. I am in a guest room and, at this point, cannot add anything else. The use of pegboard has been fantastic. One of my favorite ones is located right by where I sit so I can get to a lot of the items I use so much. I'm sorry this post was so long, but I hope you enjoyed seeing my happy scrap place or found something to help you organize your scrap room. Y'all have a fantastic weekend ... I'll be working on my Time Holtz configuration box project. Hope to post soon. It's funny how some pictures just jump out at you when you are putting a layout together. I absolutely love my annual scrap time and Disney park hop in Orlando with my bestest friends ever ... Jackie, Robyn and Wren. I'm looking forward to this year so much! Doesn't it look like we laugh continuously??? What a great day! We went to lunch for our son's birthday ... he's 26 ... actually it's tomorrow, but we were able to get everyone together today! I just keep getting older and older, but atleast I don't feel it too much. I made him a card and also took some pictures of other things I've been playing around with. I just picked up some Ranger Wild Honey distressed ink and love it! I used some stamps I had, the Martha Stewart butterfly punch, Tim Holtz film strips, and scrabble tiles. On the tag below I used Ranger Spun Sugar distressed ink, stamps I won at the last crop I was at, black "bloomers" from Webster Pages, and some Prima Fairtale Roses. I also used one of Tim Holtz's fragments that I alcohol inked and placed over a bird on the film strip. It's hard to see. I'm not happy at all with the ribbons and will look for some fibers to match this better. I have had this paper from My Little Shoebox that I LOVE! I used some "Whoo Loves You?" and "Sky's the Limit" sheets. I also added some Prima flowers and misted the small white ones. I wish I could remember where I saw how to make this decorative flower ... but you basically punch small circles and fold them toward their centers and place in a circle. If I can remember where I saw it I will post later ... sorry ... but I love the look! That's it for the crafting right now. I'm getting ready to work on a project I've been so anxious to start. It's using Tim Holtz's configuration boxes ... hope to post soon on that. I finally finished taking pictures of my scrap room ... it's finally done! I'll try to post those tonight or tomorrow morning. Just about through with my room ... I promise ... but I have been getting in some crafting too! I'm enjoying making some tags, playing around with a layout, and making a birthday card for a very special young man. I'll post the room and projects soon, but in the mean time ... HAVE A WONDERFUL ST. PATRICK'S DAY. I've been working all day on re-organizing my girl cave! I can no longer fit another pegboard on my walls so this will have to be it. I promise when it is all done and clean I will post some pictures. 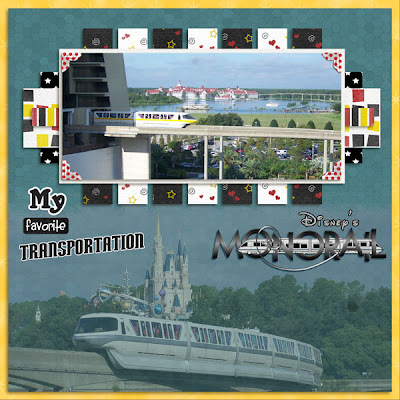 I did, however, get another layout done for one of the Template Challenges at MouseScrappers. I used "You've Got a Friend" kit by Natalie's Place Designs. 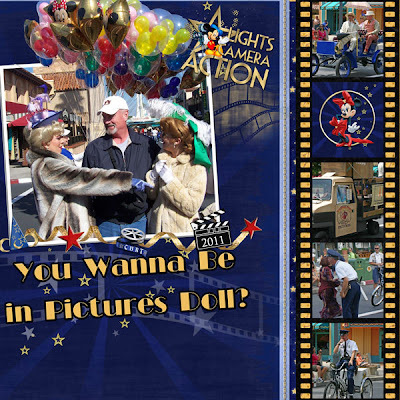 These pictures are from the new parade Disney has at Hollywood Studios called Pixar Pals Countdown to Fun Parade. We thought we had great seats ... and we did have great seats to see the parade ... just not to take pictures. They came from sunshine right into shadows and alot of my pictures just didn't turn out well. I did, however, love the pictures of Woody!! Back to work for me ... thanks for dropping by! I'm really trying to get my scrap room cleaned up and re-organized! Curt putting up another pegboard for me to hold all my Tim Holtz stuff ... ha! I did take a break and finish a Scraplift Challenge at MouseScrappers. 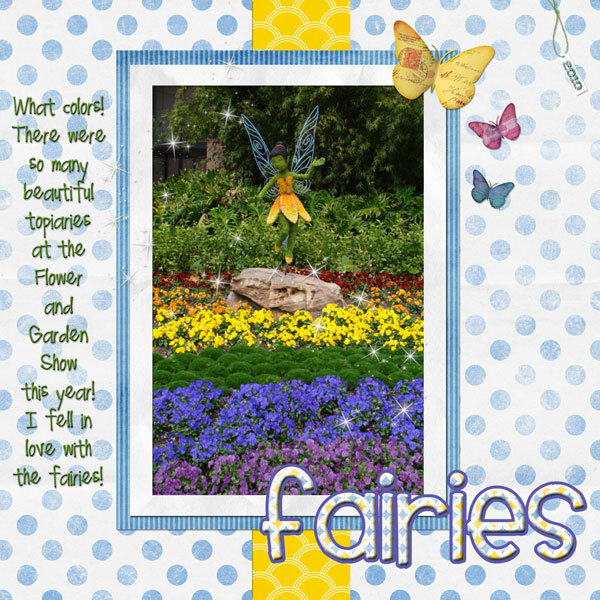 I used "Tinsel Town" by Natalie's Place Designs for this layout. I also did my first photo "out of bounds" in Photoshop Elements. The balloons look like they are floating out of the pictures ... or at least they should look like that. What fun! Gotta go ... thanks for dropping by! 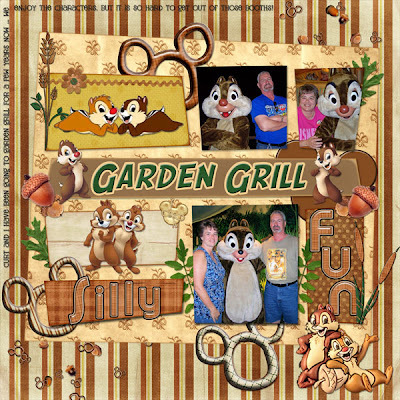 I wanted to complete this weekly challenge at MouseScrappers before I have my dental appt. I'll be going in to get a crown ... UGH! I am such a baby when it comes to dental work. I've had a number of surgeries and I can handle those better than dental work. My dentist is wonderful so I'm not worried about him getting this done right ... it's just me being such a baby. We were to scrap Disney transportation and I never knew I took so many pictures of all the transportation there! 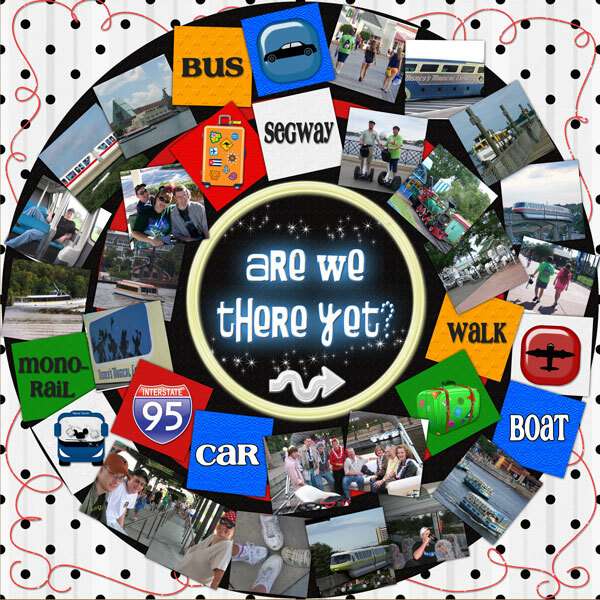 I mean, really, you can walk, take a bus, drive your car, get on a boat, hop on a segway, or get on the monorail! At least this way I get to use those pictures. The template I used was Scrap It #12 by Cari Creates Designs, "Are We There Yet" kit by Kellybell Designs, and Pixie Dust Vol. 1 by Kellybell Designs. I love it when it is still cool out, but the sun is shining. We get so incredibly hot here during the summer so I just feel great when I can have my window open and look out to see the sunshine. I would be happy to have it this way eight months of the year! I hope everyone is having a good Wednesday. I certainly had a productive Tuesday! 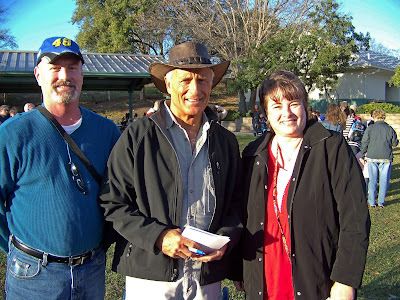 As those of you who read my blog know, I am a huge fan of Laura Denison. Anyway, she made an incredible Valentine's Day box. I watched her Ustream videos on the making of her box and then bought the instructions. You can see her Valentine's Day box and mini album at the end of her February 14th post and also at her February 10th posting ... here. I have now completed two boxes ... one for Curt for the dogs ... and one like her Valentine's Day box. First, the Valentine's Day box. I absolutely love this box. I found some old paper I had and I don't even know who it was by. I was just glad to go into my "paper stash" and finally use something from there ... ha! Here is the top of the box. I made a paper rosette for the top and used some Prima flowers. I used a knob, locket and key from Tim Holtz ideal-ology line. I also used Ranger Perfect Pearl Mist for the top to give it some glimmer! This just shows the inside of the box. This is the back of the box and I made another paper rosette and used two papers for that one. I also put a circle craft mirror in the middle and added a pearl on top of that. Now, here is the box I made for Curt. This is the top of the box with another paper rosette with two papers from the box and a cute felt puppy face from Pebbles. This shows the inside of the box and the mini album I made to go inside the box. Also, I had cut off the front flap on this box to show the dog on the front panel. I then glued that flap inside the box ... you can see it below the stripes. Here are some of the pages in the mini album. I used my Cricut to make the tags and put a dog bone on the top to help pull the tags out. I had so much fun making these and I thank you for dropping by to see them.